While porcelain sinks are normally white, black porcelain sinks are a favorable choice because you cannot see stains as easily. 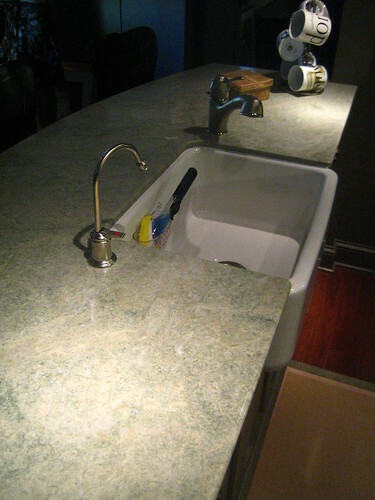 Porcelain sinks are strong and have a glasslike shine when cared for properly. The sinks become dull over time due to soap scum and hard water stains. Cleaning the black porcelain regularly helps keep the sink in good condition. Restore the shine with common household items instead of using harsh abrasive chemicals that can scratch the surface. Clean the black porcelain sink with two to three drops of liquid dish soap mixed with a bowl of warm water to remove as much of the soap and grime as possible. Dampen a nonabrasive sponge in the soapy water. Scrub on the sink gently to restore its shine. Sprinkle cream of tartar over a damp washcloth to remove light stains on porcelain sinks. Wipe the washcloth over the surface of the sink to remove the stains. Rinse the sink with clean water and a washcloth. Place 4 tablespoons of baking soda in a bowl with 1 quart of warm water to clean stubborn stains. Stir the baking soda until it dissolves in the water. Wipe the solution onto the porcelain sink to clean it thoroughly. Rinse the baking soda solution off the sink with clean water afterward. Combine 1/2 cup of warm water with 1/2 cup of white vinegar in a spray bottle to remove any remaining stains. Spray the diluted vinegar onto the porcelain sink. Let the vinegar sit for five to 10 minutes and then rinse it thoroughly. Do not let the vinegar sit on the porcelain sink for too long because the acid can ruin the finish. Combine 1/2 cup of borax with the juice from one-half of a lemon to remove tough stains from the porcelain surface. Mix the borax and lemon juice until a paste forms and then apply it to the stain with a sponge. Rub on the surface and then rinse the paste off with clean water.